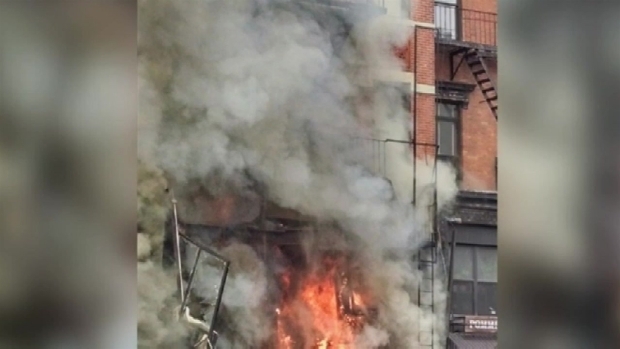 Authorities are investigating whether the gas line in a basement below a sushi restaurant was rigged in a possible gas-theft scheme, causing the leak that may have set off Thursday's fiery explosion in the East Village. Two dozen people were injured and two still are missing after the blast that leveled three buildings. "There is a possibility here that the gas line was inappropriately accessed internally by people in the building," but officials need to get access to the wreckage to explore it further, Mayor de Blasio said during a press conference Friday. He wouldn't say more about why officials believe that's a possibility. Sources familiar with the investigation tell NBC 4 New York that in August inspectors found the gas line in the basement rigged with a rubber hose to circumvent the Con Edison gas meter. This could have saved money and perhaps allowed for gas to flow to some apartments that had not yet been cleared for service. Safety violations were registered and an immediate shut down was ordered until the problem was corrected, the sources said. No one was charged with any wrongdoing at that time and the case was treated as a safety violation by inspectors, the sources said. Investigators now want to know if a similar gas-theft scheme was being employed again. The investigation is in its beginning stages and nothing has been ruled out, the sources said. Investigators are probing whether a contractor improperly accessed a gas line in a basement below a restaurant, setting off a fiery explosion that leveled three buildings, injured about two dozen people and left at least two missing in the East Village. Andrew Siff reports. The contractors working on the Sushi Park restaurant did not have permits for gas work, the mayor said Friday. The Manhattan District Attorney's office has joined the NYPD, fire marshals and building inspectors in the probe into the cause of the explosion that sparked a fire that could smolder for days in the rubble of three buildings that once occupied Second Avenue and E. 7th Street. Firefighters were still working to put out hot spots Friday, Chopper 4 video over the scene shows, and rescue workers with K9 units were on the scene searching for the two missing people. Con Ed has shut off gas to 187 residential customers and 32 commercial customers in the area as the FDNY continues its recovery work. Inspectors with Con Ed had been to the East Village building to check on ongoing work to upgrade gas service. The utility said the work didn't pass inspection, so gas wasn't introduced to the line, and inspectors gave instructions and left at around 2:45 p.m. Con Ed said inspectors didn't smell any gas. But at around 3 p.m., the sushi restaurant owner smelled gas and called the landlord, who then called a general contractor, Boyce said. No one called 911 or Con Ed, however, de Blasio said. The contractor, Dilber Kukic, and the owner's son went into the basement and opened a door, and then the explosion happened, burning their faces, NYPD Chief of Detectives Robert Boyce said. "The whole area was shaking," said Moishe Perl, who works next door. "We couldn't imagine what was going on." The building had an existing gas line intended to serve the sushi restaurant; the work underway was to put in a bigger line to serve the entire building, Con Ed President Craig Ivey said. As for whether the apartments were getting gas from the existing line, "That's a great question," he said. "We'll have to find out, through the investigation, what's going on there," he said. Con Edison later added in a statement: "As we do in all cases when a customer is upgrading to a new gas service, we conducted careful inspections at 121 2nd Avenue. Our records show the work of the building's plumber failed two inspections, including the inspection our personnel conducted yesterday afternoon. At no time was use of the new service line authorized by Con Edison. That service was locked to ensure that it would not be used. The ground-floor restaurant was being served by its current, smaller gas service line." Calls to the building owner were unanswered. The owner's son reached by phone in his hospital room declined to comment. The listed contractor did not return messages. A subcontractor hired to handle gas lines did not return calls for comment. City records show the contractor, Dilber Kukic, got a permit last June for plumbing, flooring, removing partition walls and other work at the building. 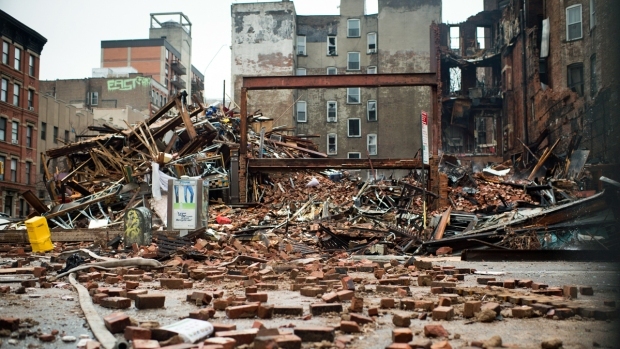 More than 24 hours after the East Village blast that leveled three buildings on Second Avenue and East 7th Street, parts of the site were still smoldering. Chopper 4 has a remarkable aerial view of the scene. Kukic had tried to help people escape the explosion and had been helpful to authorities, Boyce said. 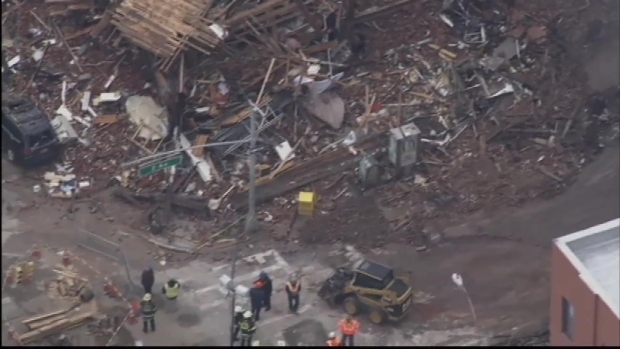 The contractor -- who's facing unrelated charges of bribing an undercover investigator posing as a housing inspector -- was injured in the blast declined through his lawyer to comment on the circumstances surrounding the explosion. Kukic is a relatively minor player in a 50-person bribery case that Manhattan District Attorney Cyrus R. Vance Jr. and other authorities unveiled last month. They said city inspectors, landlords and contractors formed a network of graft that exchanged $450,000 in payoffs to get safety violations dismissed, procure phony eviction orders and get fast, favorable and sometimes nonexistent inspections. Kukic is accused of paying $600 in cash to try to get housing violations dismissed at two upper Manhattan properties he owned. He has pleaded not guilty. Twenty-two people were injured in the blast, four critically, city officials said Friday. Among the injured were six firefighters. Patients with non-life threatening injuries were continuing to be treated and released from local hospitals. Meanwhile, businesses and residents who occupied the three buildings that were destroyed are trying to pick up the pieces. Dozens of people and businesses were displaced at least temporarily by the blast. Eleven buildings were evacuated following the explosion, though NYPD officers allowed some residents to return briefly to their apartments Friday to grab a few items. 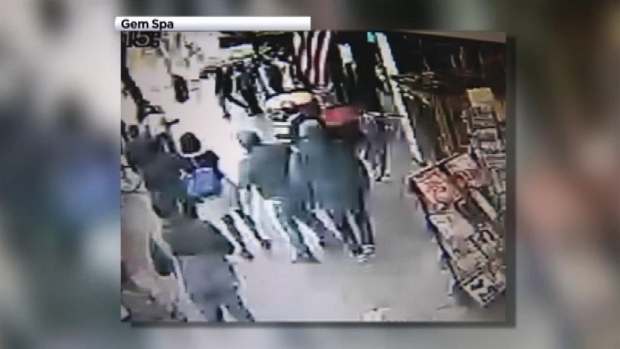 Explosion Bystander: "Could Feel It in My Chest"
A massive explosion sent people running in a panic on a busy 2nd Avenue in the East Village Thursday. Bystanders recount the impact that shook them to the core. Marc Santia reports. Chelsea Blampied, who lived in one of the leveled buildings, said she'd stopped home to get a work file from her third-floor apartment when she heard and felt the blast. "I thought a plane crashed into my building. Glass was blown everywhere, and it was just so surreal," she said. "I just heard a really loud boom," recounted neighbor Justine Miller. "I could feel it in my chest." Neighbor Troy Hinson was walking to the sushi restaurant when it "literally blew up in front of my face," and said "it really felt like my internal organs were reverberating. It just feels like everything was shaking, including my teeth." "You just don't know what hit you, it just feels like a sonic boom, there's no real other way to describe it," he said. Blampied left behind all her belongings and ran through smoke and debris down the stairs to safety as her building began to crumble. She's now staying with friends and is grateful she made it out alive. Witness video captured the dramatic moments following an explosion at an East Village restaurant that caused a massive fire, injuring 19. Bystanders rush to the building to help the injured, and an off-duty firefighter helps direct a woman down a fire escape, then climbs up himself to check for any people inside before the building starts going up in flames. Courtesy Troy Hinson. "It's so overwhelming. Everyone lost everything," she said. Gregory Dohdanowycz was in his top-floor apartment in the building next to where the blast happened. "I look out the window, and I see two buildings south of me, there's smoke rising from the windows and their roof windows," he said. He only had time to grab his dog before running outside, and was overwhelmed by the horrific sights and sounds when he got outside. Neighbor Miller said: "There was blood on the ground. There were people laying up against buildings and other people trying to help them." Actress Drea de Matteo is among the residents who lost her home and belongings in the explosion. She took to Instagram Thursday to share two dramatic photos of firefighters battling smoke and flames. "A hole where my NYC home of the last 22 years once stood," she wrote in one caption. "RIP 123 2nd Avenue." The photos appeared to be taken from a rooftop across the street. How Did Gas Travel Before Explosion? 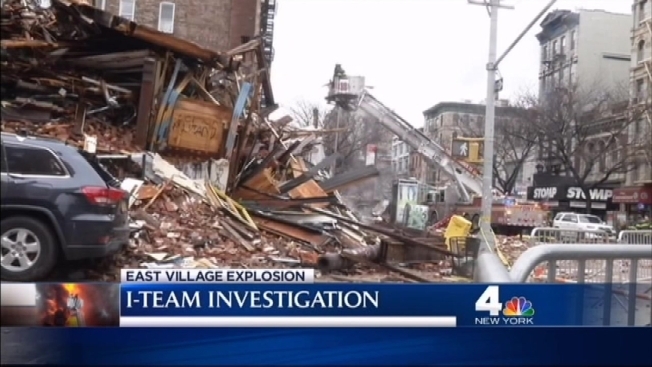 Amid questions surrounding the East Village explosion, Chris Glorioso spent time with a certified master plumber who showed us how natural gas makes it from the street to the gas meter connected to your home. Naya Jones, who spent the night at the YMCA after being told to leave her building near the blast site, went to the Tompkins Square Library Friday, where the Red Cross and other relief groups were offering financial assistance, food, vouchers and advocacy help. The Red Cross said it has helped more than 80 people since the blast and gave housing assistance to 30. The Standard Hotel is giving anyone displaced by the blaze three free nights of lodging. Sprint has also donated 25 cellphones. The ASPCA is also providing pet supplies for owners in the affected area. "It's a small community," said Bohdanowycz. "I think everyone is trying to help out when something bad happens." Hinson, who's lived in the neighborhood four years, said, "I love the sense of community, and everybody comes together and helps each other out and is here for each other." Several long-standing businesses were also affected by the destruction. Pommes Frites, a favorite spot for fries, was destroyed by the blast, and the nearby Orpheum Theater had to cancel performances of the off-Broadway production of "Stomp." 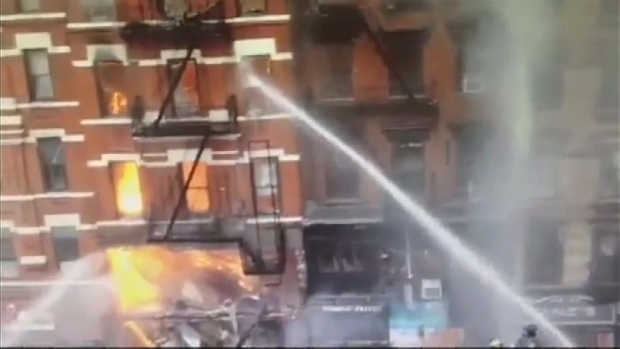 Surveillance video captures the explosion at 121 Second Ave. in the East Village Thursday. Courtesy Gem Spa. Robert Seniuk, the chef at Stage restaurant across the street, is determined to get back to work. "We open, we don't give up. This city is 24 hours," he said. Nevertheless, the frightening explosion has taken a toll on the psyche of New Yorkers everywhere. "Yesterday was a very scary day. Now all I can do is think about the people who lost their homes and people who've been living here for decades," said neighbor Adam Mashaal. Hinson said he had stopped on the corner to say goodbye to his friend just before the sushi restaurant exploded. "The fact that I was literally -- if I didn't stop and talk to my friend, I would possibly be in that building," he said. "That's kind of what's messing me up... All these crazy thoughts are going through your head after this happens, like, why me? Why am I safe, why is something again happening to me? It's just crazy. I'm having just a hard time processing it." 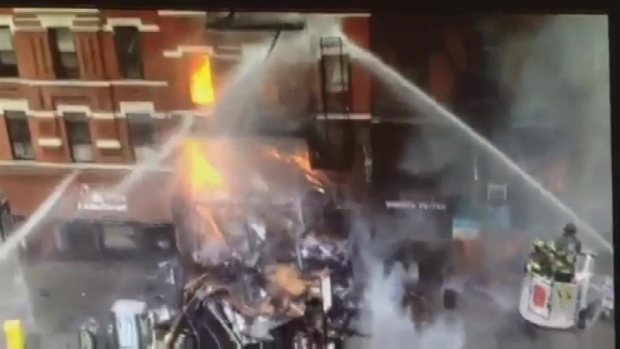 Video by the FDNY shows the precise moment a building collapsed in the East Village after an explosion at 121 Second Ave. Three buildings in total collapsed. Health officials say the air quality in the area has returned to normal levels and that short-term exposure to elevated particulate levels Thursday didn't pose a significant risk to the public. They say the smoke odor may linger, but isn't harmful. Still, those with respiratory or heart problems should remain extra vigilant. The explosion comes a week after the one-year anniversary of the East Harlem explosion that leveled two buildings and killed eight people. The blast also injured dozens of people and left many homeless for months. Since the 2014 explosion, the FDNY has been given a much greater role in responding to reports of possible gas leaks and New Yorkers are now encouraged to call 911 about gas leaks and odors rather than 311.